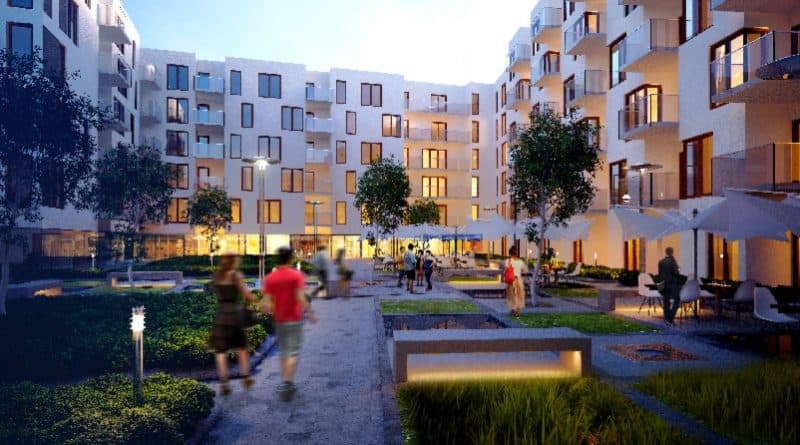 Hines welcomes confirmation of planning permission by Dun Laoghaire-Rathdown County Council for the construction of a further 146 apartments at the Town Centre (TC) 5 quarter at Cherrywood in South County Dublin. These are the latest residential units within the Cherrywood strategic development zone (SDZ) to be granted planning permission, in addition to the 1,269 apartments already under construction at Cherrywood Town Centre. Situated at the junction of Bishops Street and Tullyvale Road, approximately 1 minutes’ walk from Cherrywood Town Centre and the new Tully Park, the 15,909 sq. m TC5 development consists of four blocks of 1, 2 and 3 bed four-storey apartments. Featuring high quality design throughout, the development includes parking spaces for 189 cars and 166 bicycles. Applying the principles of the international-recognised WELL Community Standard, which supports public health and well-being, the TC5 apartments will incorporate energy efficiency and smart design standards that will provide the very best in modern living. With three brand new flagship parks, a state-of-the art all-weather multi-purpose pitch, six tennis courts, a sports pavilion, 5.4 kilometres of roadways, pedestrian footpaths, cycle paths, greenways and over 3,000 trees, Cherrywood already features all the elements necessary to ensure for a modern, healthy and dynamic community.